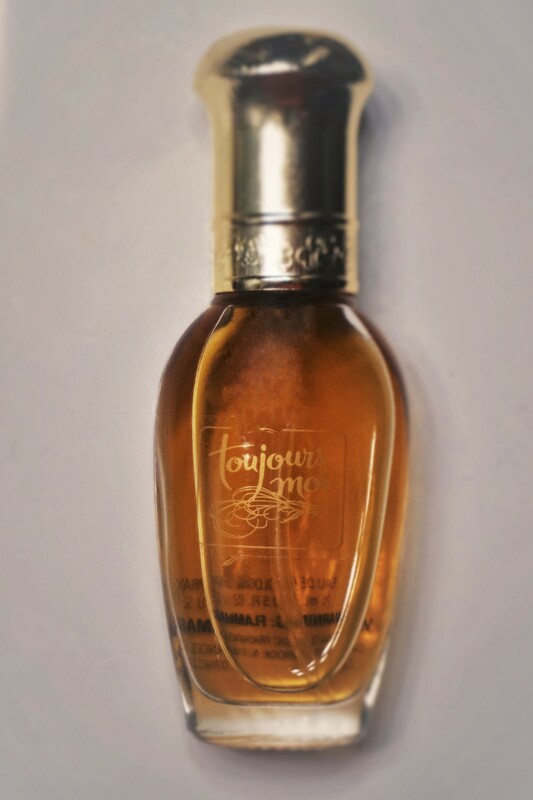 Olfactory musings of an Anglophile stuck in the U.S..
Like a sparkling glass of root beer, Toujours Moi is soft, sweet and fizzy. With a mix of warm sandalwood, musk and a combination of somewhat heady florals it’s jovial and pretty. Toujours Moi, a woody oriental, is sold in its reformulated state by Dana; the original was introduced by Corday in 1927 (Corday 1927). The current version has a great deal of sillage and longevity and while it is now a “drugstore perfume” it still retains enough of its original charm to be worth a gander and sniff. Notes: orange blossom, vetiver, jasmine, lilac, incense, musk, lavender, and sandalwood. For the next four hours Gracie, Pat, George and I play in the water, drink root beer sodas and then Pat gets the idea to start a fire and roast weenies. He and Gracie will walk into town and buy some and presumably George and I will stay here. They leave in good cheer. I’m silent, but look at him with an attempt at an understanding expression. He looks down and continues. “I can imagine it’s hard to believe.” He looks off into the deep water. “I didn’t forget about you. Just what day it was.” He looks a bit sad now but smiles slightly to himself. I’m still silent, but I smile at him. He grabs my hand and rises suddenly. “Let me show you what my life has been like. Come with me.” Grabbing my hand he starts walking off, pulling me behind him. “Where are we going?” I ask confused and curious. We reach the shipyard in a few minutes of rather brisk walking. When we’re there we walk inside a cool, shady, muddy smelling sort of room with a lot of open space and a cement floor. Then there’s a door leading to a hallway that leads to another door and then a staircase. We go up the steps. “It’s a pretty desk,” I say as I approach it, touching the wood. He comes up behind me, “Beth,” he whispers. I turn around and our faces are inches apart before our mouths reach each other and we kiss – my first kiss, and it’s lovely. The kiss lasts for a moment or two longer before we part. His hands are still at my sides and we stand facing each other quietly smiling for a few seconds before we speak. We walk out the door and reach the steps. We’re two steps down when he stops, turns around and kisses me again. It melts me and we seem to float almost the entire way back to the shore, hand in hand. Once we reach the beach, we find Gracie and Pat already starting a fire. “Where were you two?” Gracie asks, sounding confused. “I showed her the shipyard, where I work,” answers George. I smile and agree brightly. “Oh.” Gracie’s face lightens when she sees my smile. “Say, how about helping me with these weenies,” says Pat to George. The rest of the night goes by well. On the way home from the shore I hold hands with George until we reach the drugstore. Then he stops, lets go of my hand and walks a few feet ahead of us all. He lifts his arms and appears to be attempting to start a song that he wants us to join in singing with him, but instead a car pulls out of the Johnson house and roars down the path towards us. We all move out of the way, stand silent, wait and watch as the car passes us. “That’s Mr and Mrs. Johnson’s I betcha,” announces Gracie. “He rides in it to work every day.” George follows the car with his eyes. He looks down at the ground and rubs the dirt with his foot like he’s trying to rub something out of existence. George explains, “Archie married for money. I can’t think he sees a better way to make it count than lording it over everyone.” George shrugs. “He did?” Gracie sounds intrigued. Her pretty eyes focus on George intently. I smile and give him a kiss on the cheek. He grins in his warm way and then places a kiss on my cheek before we part. Of course, it’s days before I hear or see George again. I can’t say what it is exactly, but there seems to be a growing discontent that increases as the summer progresses and despite the many good times we have together, I’m always on edge. Then, one night, just after my mother serves her second helping of homemade ice cream on the front porch and leaves us alone for a few minutes, he begins, “I received a letter from home a while ago.” His face falls into a distant expression. “Oh, I’m so sorry, my dear.” I look into his face and feel his sadness. “I sure hope so. They’re awfully hard up.” His sensitive features look hardened, as if he is losing a battle he badly wants to win. That’s the last George speaks of it to me until one dreary Saturday a week later. We were holding hands. A storm had come up and there we sat alone, huddled by a rock on the shore. He looks up at me. His magnetic blue eyes are watered with tears. His face is ruddy with emotion. “Why didn’t you tell me you were going with her?” It seems pointless to ask, but I have to. “No. You’re not. You’re not trapped at all, unless you decide to be.” I breathe heavily. Nothing. I feel the chill of the air and the rain falling on my head. I hadn’t noticed it was raining until just this moment. But it’s a quiet, soothing rain. “I’m not trying to ruin anyone’s life.” His anger is evident. “No, of course not. Of course not,” my voice trails off. I decide my two choices are to stand here and argue with him trying to convince him that he should keep seeing me, or to walk away. If I walk away I’ll surely lose him, but I won’t lose myself. I walk away. That night I cry for hours alone in my bedroom. I try to be quiet, but I can’t help it. Then, I hear a knock at the door. “Come in,” I shout. “No, thank you though. You’re very kind.” He is too. He nods his head in empathy and then closes the door. I lay on my bed, close my eyes and try to fall asleep. Sleep comes, but it isn’t easy. So, my son had a severe reaction to having low blood sugar Monday morning and we had to bring him to the emergency room. We called 911 because of how bad it was and the paramedics thought he had had a seizure. Thankfully he hadn’t. He’s very healthy but apparently when kids are really little low blood sugar can affect them severely. He eats a lot, but now we feed him a snack before bed too. And, my husband was supposed to have a final interview for a job on Monday morning too. And I was supposed to have a cavity filled…. Oh, oh, and my mother’s friend decided to tell an estranged relative who none of us have seen in over ten years that we were at the hospital… And they just showed up in our er room while the nurse was trying to administer an ekg to our son. So… Sorry I didn’t post anything on Monday. Haha.